By the end of World War II, Fianna Fáil had continuously been in government for 13 years and were presiding over a stagnating economy with little promise of recovery. The self-styled Republican Party had found itself if a similar state of stagnation. They had won every election since 1932, but both their novelty and their optimism had worn. The limitations of possibility in office had been realised, and their republican credentials had been damaged by actions taken against the IRA since 1935, as well as a lack of action on Northern Ireland. Sinn Féin had been relegated to fringe status since the splits of the 1920s (and in any case were abstentionist), so the need was felt within a considerable part of the republican movement to establish a new party based on republican ideals, but free of the baggage carried by the other parties. Clann na Poblachta (the Republican Party) was founded in 1946, spurred by the death of a republican hunger striker that year. The new party set out its stall as a new face for republicanism as well as a front for new social democratic policies. It elected well-known lawyer (and former IRA Chief of Staff) Seán MacBride, son of John MacBride and Maud Gonne, as its leader. In the following year the party contested three by-elections, two of which it won. One of these victories was MacBride's own in Dublin County, which was expected due to his profile, but the other victory in Tipperary was seen as a huge blow to Fianna Fáil, which managed to retain its seat in the third by-election in Waterford. Worried about the obvious threat this new party posed to Fianna Fáil, Taoiseach Éamon de Valera called a snap election in 1948, hoping to catch them off-guard and to renew Fianna Fáil's support. This decision proved to be a mistake for de Valera, though considering the circumstances it may still have been the best option. Nonetheless, Fianna Fáíl lost 9 seats and found themselves in Opposition for the first time in 16 years. The new government was formed by a diverse coalition of all the Opposition parties: Fine Gael, Labour, Clann na Poblachta, Clann na Talmhan and National Labour. 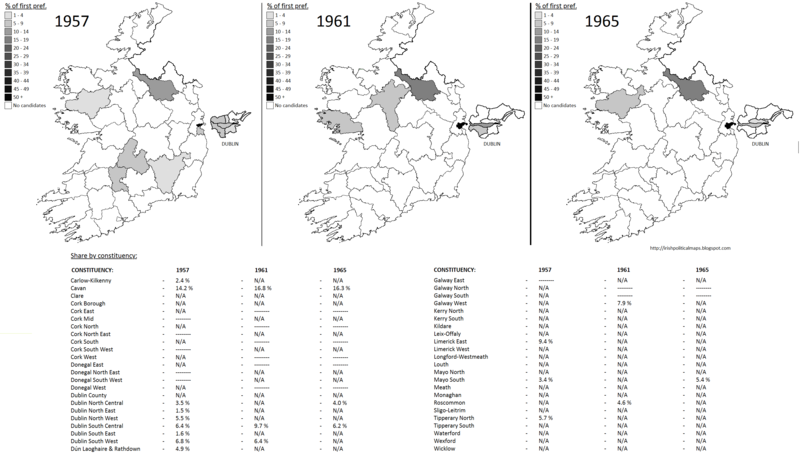 Clann na Poblachta had themselves won 10 seats, an increase of 8 taking their previous by-election victories into account. They received two ministries: MacBride became Minister for External Affairs, while new TD Noël Browne became Minister for Health. The party ran candidates in every constituency for the 1948 election: a decision which, while reasonably successful for them as a new party in a languishing political culture, proved slightly too much for the party's organisation. The Inter-Party government, as it was called, lasted for three years before another election was called in the wake of several government crises. The 1951 election proved disastrous for Clann na Poblachta, which had been directly involved in one of these crises, that of the Mother and Child scheme, by Health Minister Browne. The party lost 8 seats, reducing its representation to just 2 deputies: MacBride and Cavan TD John Tully. Fianna Fáil were back in office and Clann, diminished and demoralised, were back in Opposition. The next two elections only continued the party's decline. 1954 saw the Inter-Party government back in office, but while Clann na Poblachta (having gained just one extra seat) offered its conditional support, it did not rejoin the coalition. 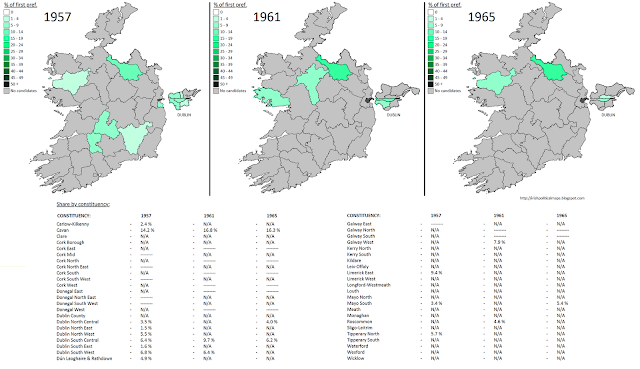 In the next general election in 1957 MacBride lost his seat, and while the party still contested the next two elections in 1961 and 1965, they ran fewer candidates each time, and in both elections returned just one candidate: the popular John Tully in Cavan. Clann na Poblachta was finished, and it voted to dissolve itself in 1965. For a party that appeared to have such a promising future when it began its life, its demise was remarkably swift. De Valera's snap election in 1948 may have fulfilled his intention to some extent. 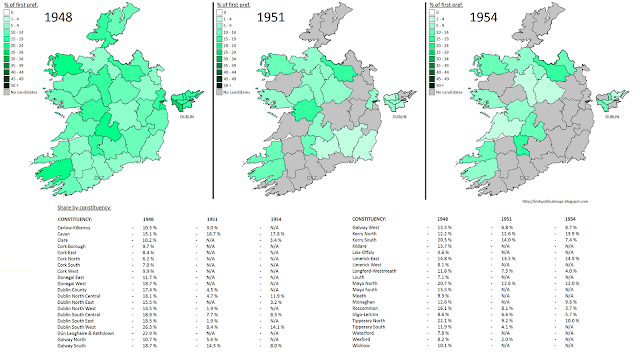 While Clann did well in that election, it overreached and exhausted its organisation far too early in its life, and it may have been hindered by its decision to go into government so soon - not least with Fine Gael, a party which was still so disregarded by those within the republican movement that its leader had to forego becoming Taoiseach in favour of someone else before Clann would agree to partner with them. The party's decline is all too evident on the maps, not simply because their vote decreased, but because in each election the party could not afford to run as many candidates as the previous one, with just four candidates running in 1965. Clann na Poblachta's short life was a lesson to other new parties not to do too much too soon - if it had spent more years building itself up as a viable and constructive party in Opposition before considering government, it may have survived longer. At the same time, the initial success of the party was proof that Irish politics, 25 years in to the state's existence, had not become so static as to exclude new ideas and groups. Greyscale versions are available here (1948-1954) and here (1957-1965).